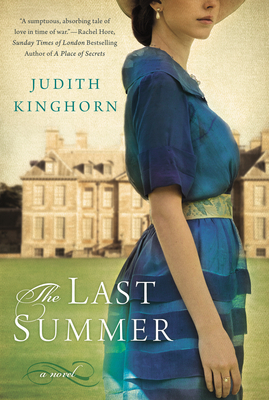 WHY READ: If you want to be transported back to a time and place much like Downton Abbey – gorgeous English countryside, a magnificent estate, the end of the Edwardian era just before Britain enters WWI, along with the British mores and social class tensions of upstairs-downstairs relationships – then you should love this book. If you seek simple, beautiful prose and a compelling female voice, you will also find this a most satisfying reading experience. Deyning Park, a Georgian classical-style country house that evokes grace and elegance amidst a bucolic landscape, is where The Last Summer takes place. It’s central to the conflict in the story, much beloved and fought for. Told in the evocative female voice of Clarissa, who lives at Deyning Park along with her three brothers, Mama and Papa, and the servants and one of their sons, it’s Clarissa’s heart and enduring romance with Tom and Deyning Park that touches us. The elegant prose deserves attention, especially since this is Kinghorn’s debut novel. It seems to take so much longer for US readers to learn about wonderful UK books and authors. I only stumbled on this book because Barnes & Noble’s smartly marketed it as part of their “Downton Abbey Collection.” I found this such a pleasurable read, wanting to share it, that I came up with the idea of developing this blog. I’m tired of always seeing the same authors on the bestseller lists when so many others are crafting novels that deserve knowing. It’s my hope that this little blog will help spread the word. “I was almost seventeen when the spell of my childhood was broken. There was no sudden jolt, no immediate awakening and no alteration, as far as I’m aware, in the earth’s axis that day. But the vibration of change was upon us, and I sensed a shift: a realignment of my trajectory. It was the beginning of summer and unbeknown to any of us then, the end of a belle époque. There are 433 pages of lovely prose, cozy storytelling but this is by no means a cozy story. It’s a heartbreaking story of love and loss spanning nearly two decades. Kinghorn’s interview at the end of the book confirms that a great deal of research went into writing about the impact of WWI, but it is her personal style of writing that makes the story feel so real and intimate, as if you have lived this story with two close friends named Clarissa and Tom. You will have to wait until January 2014 for Kinghorn’s 2nd novel to make its way to the US, The Memory of Lost Senses. In the meantime, if you treat yourself to The Last Summer and enjoy it, please share it with your friends and post a comment to me too. I promise to share your supportive comments with Judith Kinghorn.